Removing mold from your home can be quite a challenge, but it’s necessary because mold can cause all kinds of problems in the home. It’s unsightly; it damages furnishings, carpeting and other materials; it smells bad; and it most importantly it can cause all sorts of health problems. Some people prefer to handle the cleanup themselves, but you might prefer to hire a mold removal specialist, since mold removal is a time-consuming, complex process. Clean up one area at a time. Isolate that area of your house by covering doorways, vents and hi-hats with large sheets of plastic, so that mold spores can’t fly into other areas of the house. Arm yourself with protective gear – an N-95 respirator mask, goggles, rubber gloves, long pants and a long-sleeved shirt. You can find all the supplies you need for how to get rid of mold in your house at any home improvement or hardware store. Wash cloth items in hot water with regular laundry detergent. Either machine dry or line dry, but either way, dry thoroughly. Of course not all cloth items can be machine washed or even hand washed, but wash those you can. Cloth items that cannot be washed will have to be discarded and replaced. There is no other way to remove mold from cloth items. 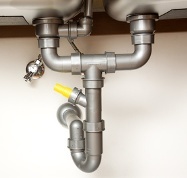 Scrub hard, non-porous surfaces like glass, tile and hard plastic surfaces with a non-ammonia soap or detergent. You can try the same soap or detergent on wooden surfaces, but it doesn’t always work so well because wood is porous to a degree, some woods more than others. Removing mold means removing certain porous items that have become contaminated with mold and replacing them with new items, like drywall or sheetrock, carpet and the padding underneath carpet. It’s usually just not possible to scrub those items clean and they need to be replaced. Its usually impossible to get all of the mold off wood, like wooden wall studs. You should replace moldy wood. If you can't, then clean off as much of the mold as possible and then encapsulate the wood. 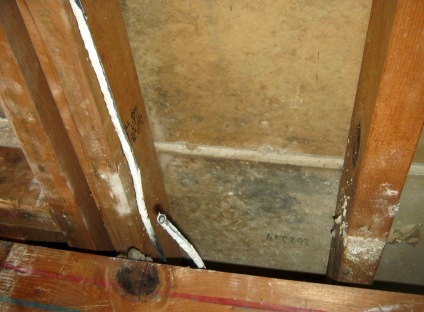 If you don't remove mold from the wood then your new drywall or sheetrock will soon become contaminated. The North Dakota State University Extension Service recommends spraying wooden surfaces lightly with water before cleaning them so that mold spores don’t fly about in the air where they can contaminate other surfaces and also be inhaled, causing health problems. The North Dakota State University Extension Service also recommends rinsing all surfaces with a disinfectant after scrubbing off mold. Doing a very thorough job when removing mold is important because if just a tiny bit remains, it can grow and spread and soon you’ll have a larger problem again. After removing mold from surfaces, allow surfaces to dry thoroughly. A fan or a dehumidifier can help dry large areas, especially, in poorly-ventilated rooms. 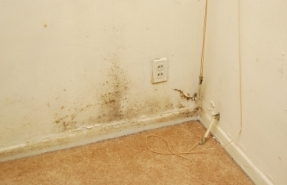 If the areas do not dry completely, you will likely end up with mold again. If mold grew in your house, it’s because you had a moisture problem. 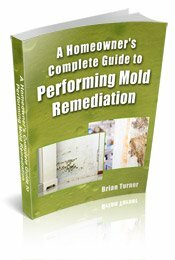 The Environmental Protection Agency clearly states that you must fix the moisture problem if you want to get rid of the mold. If you clean up the mold but don’t fix the moisture problem, the mold will just come back. So fix any leaks, improve ventilation and install a dehumidifier if necessary, to prevent mold from returning. You can also consult with a mold removal specialist about how to fix any moisture problems in your house. For assistance with mold removal, contact a mold removal professional. Most offer free assessments and will visit your home, help you locate all areas of mold growth, and advise you about the type of work that needs to be done. Even if you opt to handle the mold removal on your own, you can get some valuable advice from a professional by scheduling a free assessment. Click here to get a list of mold removal professionals in your area. Mold found growing in an attic. Attic mold removal is usually a job that only professionals should attempt because insulation, ductwork and sheetrock may need to be replaced. Also removing mold from wood is very difficult.